After you switch to vaping, you’ll quickly find that replacement clearomizers – or replacement atomizer coils for your tank – represent perhaps your largest recurring expense. For some people, the cost of purchasing replacement coils actually exceeds the cost of buying e-liquid. Does that sound like your situation? Do you experience a constant burned taste when vaping that forces you to replace your clearomizer or atomizer coil daily? Vaping doesn’t have to be that expensive! In this article, we’ll discuss some tips that you can use to make your atomizer coils last longer. The atomizer coil in your tank or clearomizer generates intense heat, and it takes only a fraction of a second for the coil to heat up. That’s why it’s possible for your e-cigarette to fill your mouth with vapour almost instantly when you press the button. All of that power, however, comes with a significant drawback: If the coil is dry, the cotton wick will burn. To have a great vaping experience and avoid terrible “dry hits,” the most important thing to remember is that your atomizer coil must always stay wet. To ensure that happens, heed these three tips. Don’t “chain vape.” Wait a few seconds after each puff to let your atomizer coil become wet again. If you have a vaping device with adjustable wattage settings – and you enjoy long, deep puffs – keep your device’s wattage low. High wattage settings and long puffs will surely dry your atomizer coil out. Don’t put off refilling your tank or clearomizer when the level of e-liquid is low. If the e-liquid doesn’t completely cover the atomizer coil’s wick holes, it’s time to add more e-liquid. If you read about vaping online, you may see the term “coil killer” used in conjunction with certain e-liquids. When people use the phrase “coil killer,” they’re usually talking about sweetened e-liquids. When used in e-liquids, sweeteners such as sucralose are delicious. A sweetener can really enhance an e-liquid with a candy or dessert flavour profile. The drawback of using sucralose in an e-liquid, though, is that sucralose doesn’t vaporize. It sticks to the atomizer coil and forms a film that caramelizes and eventually burns. 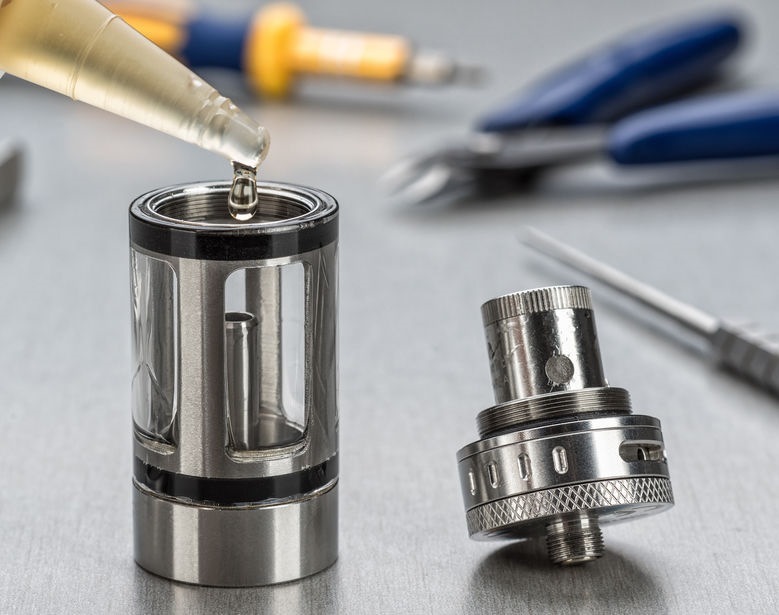 If you’re a heavy vaper, you may find that your atomizer coil develops a thick, dark film – vapers call that film “coil gunk” – after as little as a day of vaping. If your atomizer coil has enough coil gunk on it, you’ll find that all of your e-liquids taste like burned sugar or – even worse – burned cotton. If you want to avoid that terrible flavour, you’ll have to avoid sweetened e-liquids. Never fear; many e-liquid flavours taste sweet even without added sweeteners. Sweetener is the largest factor that contributes to coil gunk, but it isn’t the only factor. Some of the flavouring compounds in your e-liquids may also fail to vaporize cleanly. Many people find, for example, that tobacco extracts and “cotton candy” flavourings decrease coil life – and the more strongly flavoured an e-liquid is, the more likely it is to cause coil gunk. Did you know that some people can manage to use their atomizer coils for weeks before they notice a drop in flavour quality? Most of those people are using e-liquids with extremely mild flavours or no flavours at all. If you’re tired of frequent coil replacements, try an unflavoured e-liquid. Since vegetable glycerine – a common e-liquid base – tastes a bit sweet on its own, you may find that you quite enjoy the taste of unflavoured e-liquids. Sweeteners and flavours both shorten coil life by causing coil gunk to form – and the more e-liquid that you use, the more quickly coil gunk will form. People who like sweetened e-liquids and use powerful sub-ohm vaping devices often find that they need to replace their atomizer coils every day. Do you love sweet e-liquids? Try switching to a lower-power vaping device such as the EVOD e-cigarette. If you also increase the nicotine strength of your e-liquid, you’ll continue to get the same amount of nicotine that you’re getting now. Since you won’t use as much e-liquid, though, you’ll find that you can use sweet e-liquids without incurring the cost of daily coil replacements. Using less e-liquid will also mean that you won’t pay as much to vape. What Are Low-Resistance Clearomizers and Atomizers?